Not-so-simple questions are also welcome. Please email us if you have one that isn't mentioned here. • How much does Sicily Concierge cost? • What is Sicily Concierge and what can it do for me? • How is Sicily Concierge different? • What is the quality like? • What's the difference between Sicily Concierge and an 'online' travel consultant? • How do I plan my visit? What is there to see and do in Sicily? • Do you plan events? • Do you plan weddings? • Do you rent out villas? • Do you arrange cooking classes? • Do you do winery tours? • Is Sicily Concierge associated with any hotel chain or other firm? • Why are there not more details (like names of wineries) on this site? • What about the services of Ms/Mr X in Sicily who quotes a lower price? How much does Sicily Concierge cost? Each service is unique so pricing varies, but there is no reseller between you and us, so the rates reflect that, being quite competitive (and perhaps even lower than what you were expecting). We'll provide detailed pricing and purchase conditions, based on the specific service you request, as soon as we begin working with you. Where there is a planning fee, it will be credited toward the total cost billed for your trip. • A couple wanted to go on a helicopter ride over mount Etna, Europe's largest active volcano, and we organized it on a clear spring day when the summit was covered with snow and the mountain was spewing just enough smoke to make it interesting without impairing visibility. • To celebrate a wedding anniversary, an American gentleman wanted to surprise his bride, during a planned visit to Palermo, with an evening at the opera. This was arranged, complete with a horse-drawn carriage to take them there, and dinner beforehand in a medieval castle in the center of the city. It was a magical, unforgettable evening. • A group of six adult travellers wished to organize a very special, fully customized tour of Sicily including several wine tastings, stays in 5-star lodging but also in aristocratic country estates, and only the best guides. Their trip was a resounding success. • A couple traveling independently with two children wanted to have somebody meet them at the airport and then be "on-call" during their stay. What you're really buying is peace of mind. • A small group of four traveling companions wanted to organize a unique shore excursion during a cruise ship's call at Messina, but it was the last minute, just three days before their arrival. Two tour companies had already been unable to plan the excursion, but we did. • A group of fifty-three visitors from northern Europe required a gala evening in an aristocratic palace outside Taormina. Held on a cloudless summer evening in a courtyard full of regal atmosphere, it was an event to be remembered for a lifetime. • The scheduled speaker (a historian) for a group of 30 on a historical tour cancelled at the last minute. The tour's director contacted us the day before the presentation saying she needed a competent substitute fluent in English and extremely knowledgeable about medieval Sicilian history. We found one. • When a film producer needed assistance with location scouting, we were asked to work with his crew to suggest appropriate settings for specific scenes. How is Sicily Concierge different? Our people are the biggest difference. Most concierge or travel consultant services are offered by large travel companies outside Sicily, placing an intermediary or two between you and the travel specialists you may meet when you arrive. These companies may create the illusion of a "branch office" in Sicily, but we're the only firm offering concierge services that actually has an office here. We're based in Palermo, Sicily's largest city, and we have more native English-speaking staff than any other travel services company in Italy south of Rome, including three full-time concierges. But the most important difference is our experience and attention to detail, with nothing left to chance. If you've read this far, you already see the advantage of having your own travel concierge. There's really no substitute for this level of service. Compared to anything less, it's like enjoying a private flight in your own jet instead of squeezing into a "coach-class" seat on a crowded commercial flight. The quality of our service speaks for itself through our satisfied clients but it reflects a special philosophy. We sincerely believe that your needs, and style of travel, are unique, and we build your travel experience around this. That may mean an "insider's" access to a local sight, such as an aristocratic home where your host is descended from the family that has owned the residence for five centuries, or an escorted tour with one of the very best tour guides in Sicily, who is exceptionally knowledgeable and speaks English as her mother tongue. What's the difference between Sicily Concierge and an online travel agent or consultant? Speaking generally (as recent changes in the travel industry have greatly redefined travel professions), a travel agency resells standardized tours or services for a commission, and may also sell flight tickets. A travel consultant is a travel agent who sells tours and flights (though nowadays most flight tickets are sold by the airlines directly) but may also offer slightly more specialized services. A tour operator arranges group tours which may include airfare to your destination. Of course, these broad definitions vary somewhat depending on where you live, so it's understandable when even seasoned international travellers confuse one term for another. Sicily Concierge is operated by a full-service agency based in Italy which, in addition to our personalized concierge service, provides all these "traditional" services – though in practice we rarely book flights. How do I plan my visit? What is there to see and do in Sicily? An excellent place to begin is Best of Sicily, which offers useful information about our island. Do you plan events and conferences? Yes! These services are described on a separate page. We have occasionally organized the receptions for large "destination weddings" in unusual settings such as castles or country estates. Speaking generally, however, we leave the bureaucratic aspects of wedding planning to specialized wedding planners because a civil wedding in Italy requires a great deal of prior documentation, while a church (Catholic) wedding entails certain conditions and procedures. Do you rent out villas? While we occasionally search for a villa rental according to a client's needs, usually as one element of a more complex service which has been commissioned, this is a highly specialized area. Often, the "bureaucratic" complexity of villa rentals is insurance of the villa for liability and injury of guests, an element very few villa owners or leasing agencies address specifically or adequately. Yes, usually in Taormina or Palermo. Do you do wine tours and winery visits? Yes – and you'll find our suggested wineries much more intimate, interesting and exclusive than those larger, more "commercial" estates proposed and "promoted" by other travel agents and tour operators. Most are family-owned wineries that have been producing wine for a century or two. Is Sicily Concierge associated with any hotel chain or other firm? No. Sicily Concierge is part of a completely independent company based in Sicily. We do not represent the commercial interest of any hotel or other travel service suppliers, nor is our business based on receiving commissions from them. For example, we are not the holders/owners of the firms which own the sail boats (or small yachts) rented to our clients. This is an important point to consider because it ensures that we are impartial, setting us apart from the would-be "travel consultants" who are actually nothing more than "travel brokers" in disguise. The advice, recommendations and service you receive from Sicily Concierge are reliable and unbiased because we work for you, not for a firm trying to promote a specific product or service. As we said, Sicily Concierge does not receive commissions from the hotels, wineries or other businesses featured in your visit or itinerary; in those cases where we are entitled to such a commission (usually at least 10 percent), we simply credit that toward a comparable reduction in the price that you pay. Why are there not more details (like names of wineries) on this site? We try to discourage competitors from "cloning" our services. Imitation may be the sincerest form of flattery, but we'd prefer to keep our proposals between you and us. What about the services of Ms/Mr X in Sicily who quotes a lower price? Naturally, it's possible to get a slightly lower quote from a competing agency, but in reality many "agencies" advertised on the internet – even on popular travel advice sites – are one-person firms unlicensed to provide such services. In other words, they are only partially legal. Some are operated by chauffers or bus drivers, others by folks lacking the tourism credentials required by law here in Italy. Despite attractive photos and flattering "testimonials" on appealing websites that emphasize the owners' personalities, charm and "experience," they may lack the legal authority (and insurance) required in Italy to sell, organize and furnish tourism services. Perhaps they operate nothing more than a non-profit organization or tax-exempt "cultural association." Often, the "team" presented in their publicity is little more than a group of outsourced "experts" or a few friends seeking to earn some extra money. That might seem like a trivial point, but to be licensed as a tour guide necessitates earning a university degree in a relevant field, such as history, being proficient in a language other than Italian, and sitting a rigorous exam. Consequently, Italy's licensed tour guides are highly knowledgeable. Very few unlicensed, self-styled "guides" are competent. Strictly speaking, there is no such thing as a home-based "travel consultant" in Italy, where the only authorized travel-planning professionals are those whose firms are licensed. The liability insurance required by law for failure of performance of service (if an agency goes bankrupt and closes before your arrival) is available only to licensed tour operators. We do not wish to "attack" competitors or suggest that you, the customer, police the travel field (even visiting travel writers are sometimes deceived). We simply want you to know what you are purchasing. Italy's tourism laws exist for your protection. Contact us with your idea, or with your question about one. You'll get to know us right away. We'll get to know you and plan your successful holiday in Sicily. 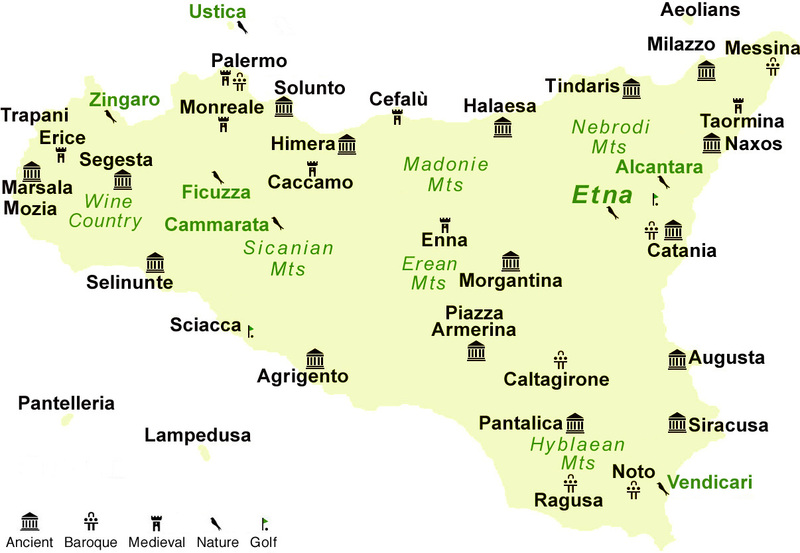 This map shows you where some of Sicily's more interesting attractions are located.